Hi everyone, this is my first post on wordpress and I would like to talk you about how connect and get working a HC06 BlueTooth module with an Arduino board. HC06 BlueTooth modules are common to find on my city’s electronic stores. So, in this topic, we are talking about on how to mount this module on the Arduino UNO board. Before to continue, I must to say that I’m not an expert in electronic and circuits. Previous to have HC06 module working with my Arduino UNO and communicating it with my PC and my Android phone, I need to read a lot of information about circuits basics. So, I will try to make next explanations easy to understand for those non experts like me. 3. 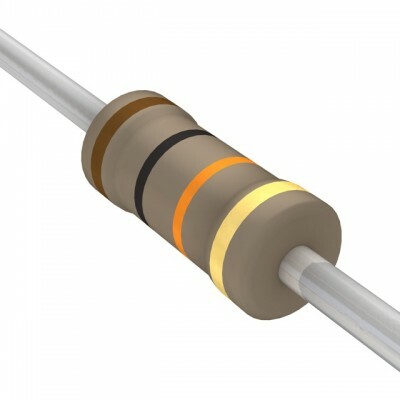 One 10K Ohm resistor (check that colors order is: brown, black, orange and gold). 4. Two 1K Ohm resistors (check that colors order is: brown, black, red and gold). 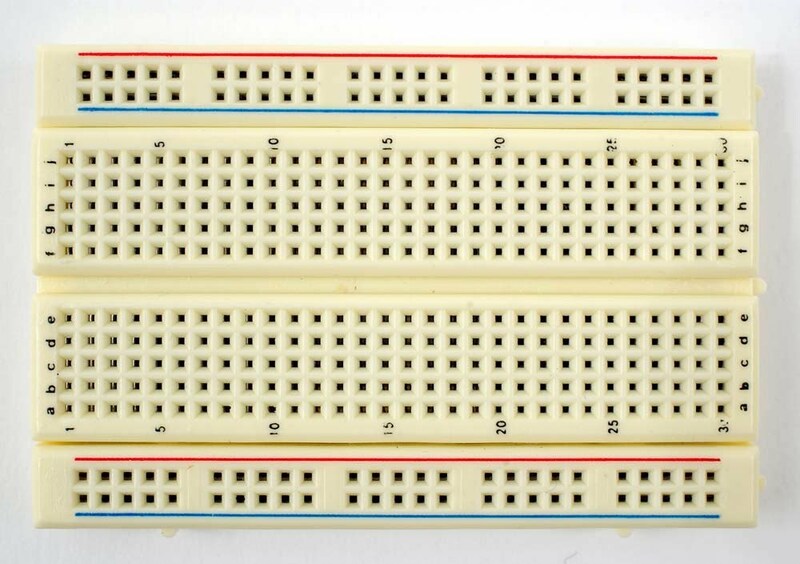 We will using this resistors later to highlight the arduino board on BlueTooth reads and writes. 5. Two Leds. We are using it to highlight the Arduino board. I recommend you different colors to make an easy difference between reads and writes. 6. One protoboard to mount the experiment. 7. Wires to communicate the circuit components. 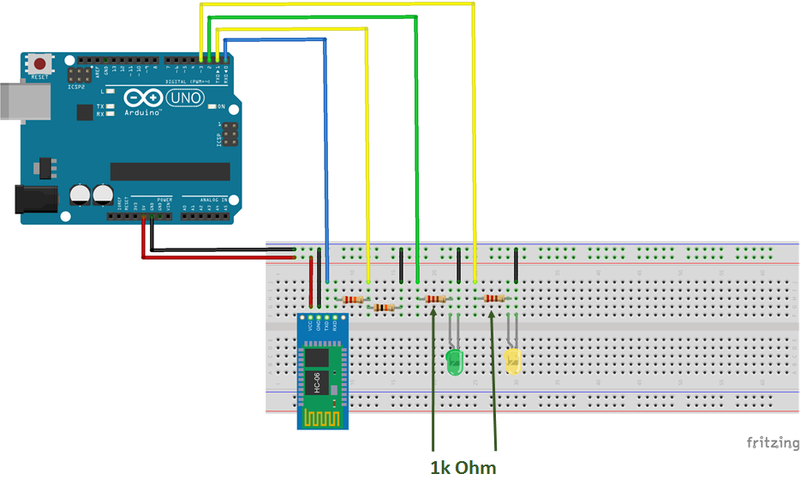 In order to mount the circuit, this page was very useful for me: http://42bots.com/tutorials/how-to-connect-arduino-uno-to-android-phone-via-bluetooth/. 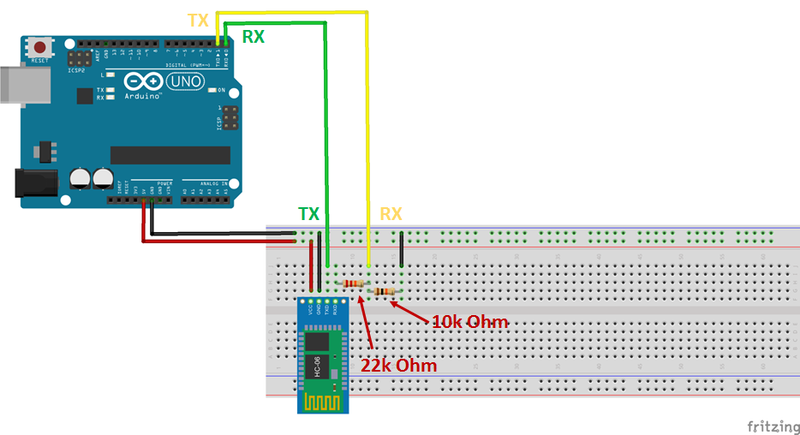 The most important in this step is how to connect the circuit using the 20K Ohm and 10K Ohm resistors between HC06 RX pin and Arduino TX pin. After you have read the link, lets go to develop the experiment step by step. After you has assembled the circuit, connect the Arduino board to your PC or Laptop using the USB cable. If all is ok, you are observing that your HC06 module leds are blinking. 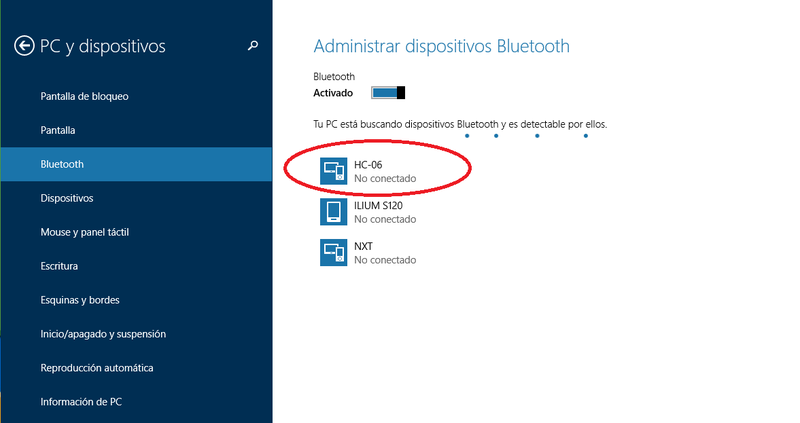 And, if you have your PC Bluetooth sensor on, HC06 can be discovered by your operating System. 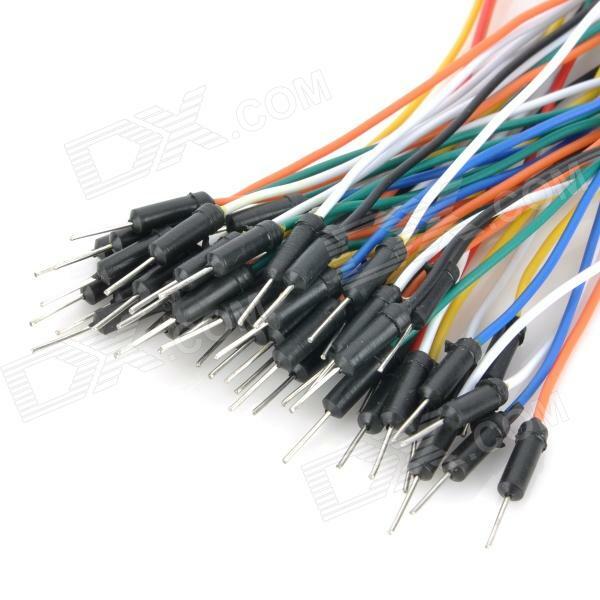 At this time, you can pair the PC and the Arduino board, but you don’t get connected. Common pairing code for BlueTooth devices is 1234, but, if is not correct for you, check your device manual to find the correct pairing code. If you can see your device, that means that you are in the right way. 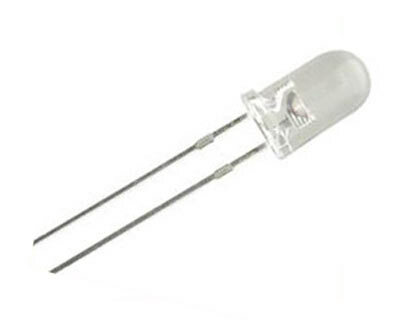 In the above circuit, is very important that you use right resistors with the HC06 module, otherwise you will toast it. In above circuit, we are lighting the green led on incoming (reading) Bluetooth data. The yellow led will light when the Arduino sends data. Finally, the last part on Arduino side is programming it in order to have a two-way communication. This is a very important part, because, your Bluetooth module will transmit and receive data using the Arduino Serial Port (RX and TX pins). 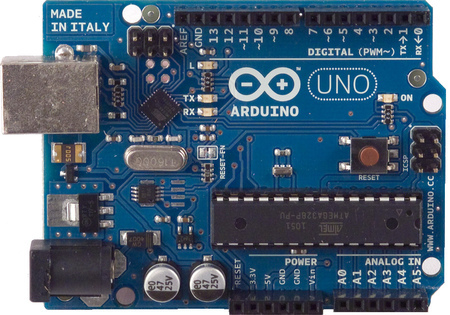 In fact, the Arduino program is a very easy routine having use of the Serial Port. You can find many examples here, here and many others. 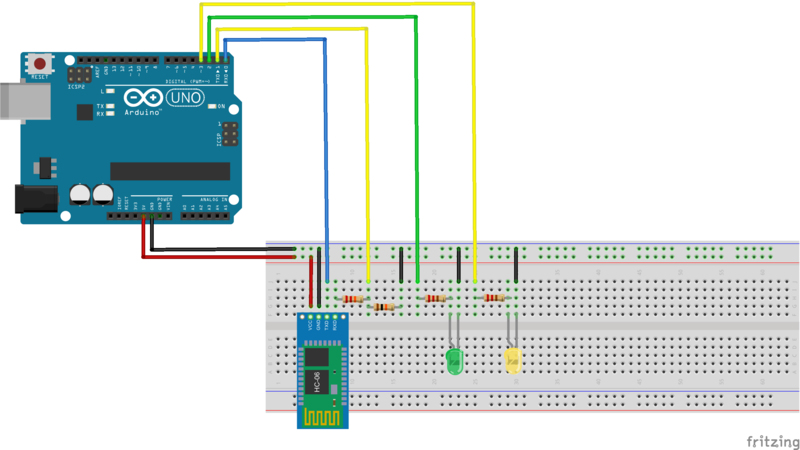 Copy the above code and paste into your file sketch and load it into the Arduino board. When you have programmed the Arduino board, you will see the HC06 module blinking and the write led ON all time. This is because is a very small time between writes. On nex post I will to explain how to communicate your PC or LapTop with this circuit. Finally, I want to thank to Fritzing team because with their great software, I can to model the circuit images shown above. Thank you to this entry, for share the HC06, component for the Fritzing software. Enjoy building your electronic experiments!